Send your Gift E-Voucher today!.. Use our Cocktail chooser to find the right cocktails for you! Use our unique configuration tool to select the right wine for the right foods. Enquire about the services that we offer our trade customers. We are always interested in buying your fine wine & spirits. 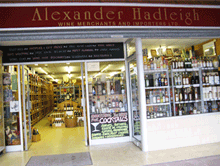 Alexander Hadleigh Wine Merchants are an independent wine merchants located near Southampton. We are proud to stock one of the most extensive ranges of alcohol across Southampton. Whatever your required taste, we have something for everyone from wines, single malt whisky, spirits such as rum, cognac, armagnac, gin and vodka, also liqueurs, champagne, sparkling wine and fortified wines. When combined with our array of cocktails, wine accessories, glassware and gifts, our range is probably the finest and most comprehensive selection available in the UK. We ensure within all the above categories that we have prices to suit all budgets. We also provide secure UK and Worldwide delivery (terms and conditions apply) and accept most credit and debit cards via our secure and confidential SAGEPAY payment system. Also you have the alternative option of telephoning in your orders, or even visit our wine shop near Southampton, Hampshire, just off the M27, where we hold stocks of most of our wines and spirits. Buying for a present or gift? As we are one of the eminent wine merchants in the South of England, we have a range of gifts suitable for all occasions from hampers and wine gift boxes to bottle openers and holders. Whether it’s a birthday or you just want to say thank you, our gifts are the perfect present for anyone. Corporate Gift Service - Our speciality! Don’t worry if you’ve left it too late, our e-vouchers can be sent on the same day you buy them, then let your recipient choose their own gift.